Today I met up with my younger brother and sister-in-law K&T, who were in transit to Hungary (where they live) from (South Africa where his and my family live) after spending a few weeks in SA on holiday. We met up at a wee pub at London Bridge station and enjoyed a cuppa and a nibble. I have not seen them for some years now and again I am amazed at how the time flies. It never really seems like a long time because we communicate via facebook and email, so you are more or less aware of whats happening in their lives (family & friends), so when you meet it feels like only yesterday you last met up! We chatted about various things; like what I am up to in London and what they are up to in Hungary and then my brother gave me a ‘Dr Who’ type jolt back into the past…..and I am talking distant past here!!! (you know you are getting old when you talk about things that happened decades ago!) We have a pretty muddled family with loads of marriages and remarriages which brought with them half brothers and half sisters as well as step sisters and step brothers! One would like to think it was one big happy family….. The jolt came in the form of some photos! As he said, how on earth they came to be in his possession is a total mystery, the reasons for that being way too long to explain, suffice to say the photos were of one branch of the family whereas he is from another (it is as complicated as it sounds). Anyhow to get to the point (sorry I do tend to waffle)……amongst the photos he showed me, were some photos of when I was a wee girl of 11 years old! My god! Did that ever bring back a flood of memories. In the photos are me (11yrs), my younger sister (8yrs), my cousin (12yrs), my stepsister (10yrs) from my mother’s 2nd husband and my baby half-sister (approx 9/10months) from that same marriage. 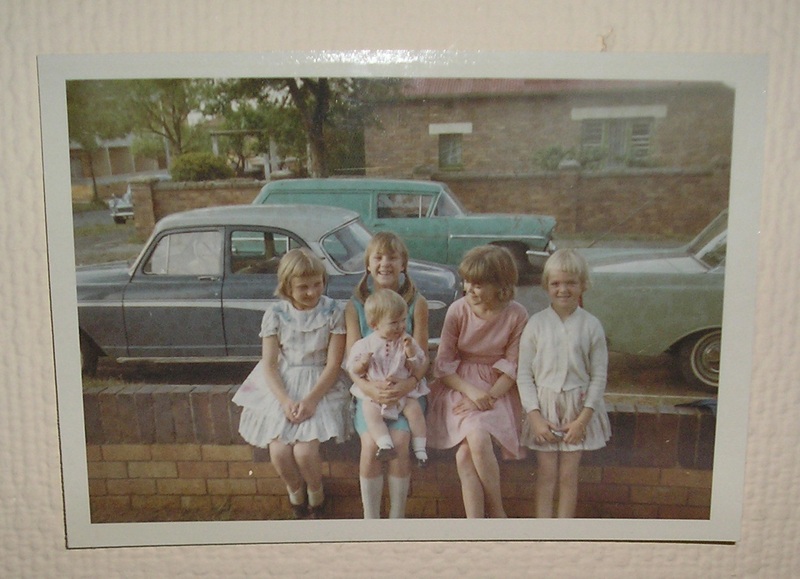 I was absolutely flabergasted and it was a real trip down memory lane to see us all……5 little girls looking so happy and sweet in the photo with not a clue as to the future………..and what a good thing that was too. Anyhow here is the photo. Glad we could meet up and glad I found those photies! Hope this spurs others to share theirs. thanks Kevin, it was great to see the two of you and I appreciate that we were able to meet up. not enough time as always but good nevertheless. have fun and thanks sgain for showing me the photos….that was quite amazing. Man alive that was a loooong time ago!! And yes you would have to drug me to get me into a dress again, altho, I was dared (by my 22 year old son) to buy a denim skirt some 6 years back, which I duly did and have managed to wear it exactly 3 times since!! As for that perfect pudding bowl hair cut, the less said the better!!! Thanks Kev, some more of these please, I dont have any! !